Voices and Freedoms is Richard R. Guzman’s first book, written during the U.S. Bicentennial year, and turned into a 16-part radio series of the same name shortly after its publication. 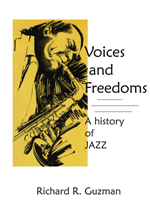 The book looks deeply into the nature of jazz and improvization, follows its evolution as the music seeks greater and greater “freedoms,” and shows how these freedoms can always be heard as expressions of human “voices.” It explores the work of some of jazz’s greatest players: Louis Armstrong, Fats Waller, Charlie Parker, John Coltrane, Thelonius Monk, Ornette Coleman, Cecil Taylor and many others. It is being reissued as both an E-book and a pdf download, both available soon on this site.